Kula Shaker. Photo by Joshua Kessler. Courtesy of Columbia Records. A friend of mine once conjectured, What if the ’60s weren’t an era, but a place one could still visit? Envision it, a Bermuda triangle of land nestled in a hidden valley; the question being, once they found it, would anybody leave? Certainly time has marched on, but as we hurtle toward the millennium, retroculture progresses geometrically. Or, as the artist Beck announced to a crowd of kids in front of the stage at a recent gig, “Stop moshing! It’s so 1992.” To listen to Beck’s much touted “Odelay” is to hear the history of pop music as filtered through an appropriately ironic sensibility that makes it contemporary. In fact, he’s the best example of an important point: it’s fine to wear one’s influences on one’s sleeve as long as you have something else up there. Which brings us to an English band, Kula Shaker, fronted by Crispian Mills (son of Hayley), who make an argument for pre-natal conditioning. Harking back to a time when Eastern influences (TM, sitars, etc.) were making a visible dent in hippy culture, Kula Shaker sound as if they might have accompanied the Beatles to India, but, and it’s an important but, after absorbing what they needed, bounced back to 1997 to document the trip. In other words, we hear where they’re coming from, but it’s okay. Because, apart from the band’s sometime use of Hindu lyrics and instrumentation, along with more Anglo-pop psychedelica, what really sets them apart from so many ’60s wanna-be’s is the fact that they’re good. And, ironically, practically over as the next big thing. After about a year of heavy promotion, including ads in movie theaters, they’re already being dissed by English music rags, a sure sign of mainstream accessibility and lack of credibility. Thirty years, 30 months, what’s the diff? However, while it’s perfectly understandable that most adults don’t have the time and/or inclination to hang out at the listening posts at Tower Records, that doesn’t mean there hasn’t been any good music since whenever they stopped paying attention. In truth, for every 20-year-old musician infatuated with the past, there’s an aging equivalent (U2, Bowie) borrowing his or her technology. As they said in the ’60s, be here now. Now is then. And vice versa. Meg Remy of US Girls talks to the former Sic Alp about anger, publicity, lyrics, and Roald Dahl. Ghost stories, paganism, the blues, and silent cinema are just some of the fixations of two authors known for novels steeped in history. 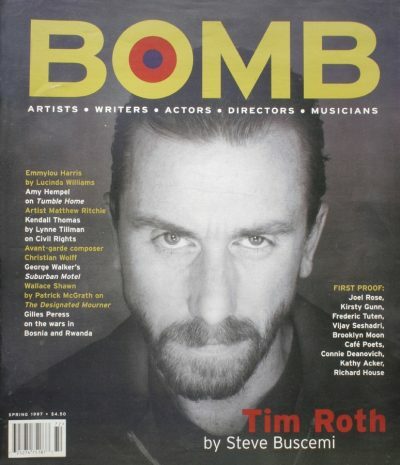 Featuring interviews with Tim Roth, Amy Hempel, Emmylou Harris, Matthew Ritchie, Wallace Shawn, Christian Wolff, Gilles Peress, Kendall Thomas, and George Walker.